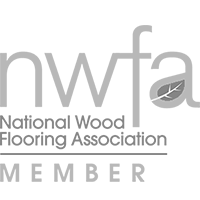 This naturally healthy, water-resistant flooring consists of linoleum mounted onto HDF with a cork backing for a warm, comfortable, quiet flooring solution. Made primarily from renewable resources, it features inherent antistatic and antimicrobial properties that repel dust and dirt, making it easy to clean and reducing exposure to allergens, while inhibiting the breeding of harmful organisms. Available in panels (approx. 12”x36”) and squares (approx. 12”x12”).